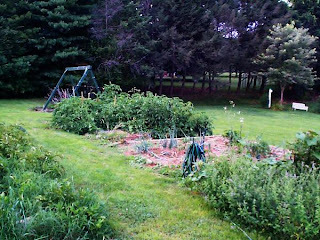 We've tilled the past two years, but last summer Justin decided he hated pulling weeds (which I also hate), and so by the end of the summer he was mowing the garden! The fact that it wasn't full of produce is another "story". I stumbled upon a similar method (pretty much identical) called the "Ruth Stout Method." Since last fall we've been collecting leaves and straw and laying it down nice & thick in the garden. We're letting our compost pile settle a little bit more (chicken poop), but will add it in to the garden within a month (we're also putting up new fencing around it - how DO you keep your dogs out??!? ), then cover it again with straw. Same basic principles. We're hopeful this year will turn out much better. Looks like a brilliant way to garden to me! I know what you mean about being inundated with one variety of veg - with me it's usually tomatoes (can't help growing 1001 varieties) & courgettes - we couldn't keep up with using them all last year so gave them away will-nilly!